Roman aqueducts moved water through gravity alone. The first aqueduct was built in 312 B.C.E. ; a few are still partly in use. The Inca constructed buildings from huge stone blocks fitted so precisely that no mortar was needed, but didn't have wheels or use animals to haul the massive stones. The Great Pyramid of Giza, built 4,500 years ago, is still standing, but scholars disagree about how ancient engineers sited the monument so that it aligns almost perfectly with the cardinal compass points. "It's pretty mind-boggling what they accomplished with the tools that were available to them," said Kevin Hall, a professor of civil engineering whose research focuses on transportation materials. "Clean water, reliable spaces to live and work, efficient transportation systems, defense — these challenges are universal. Let's look at their solutions to these issues, bring those thought processes forward and apply them to the problems we face today." 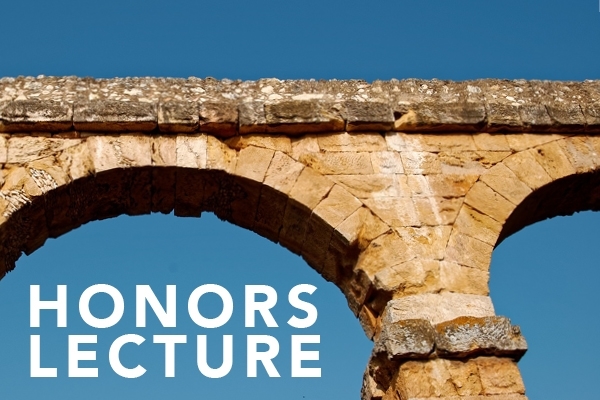 All on campus and in the community are invited to attend "Engineering Antiquity," a free public lecture by Hall that previews his Fall 2019 Honors College Signature Seminar on this topic. The lecture will take place at 5:15 p.m. Tuesday, Feb. 12 in Gearhart Hall Auditorium (GEAR 26) and will also be streamed live on the Honors College Facebook page. Hall will look around the world for examples of ancient ingenuity, and will consider the ethical dimensions of new technologies, which can have unintended consequences. "For example, if you automate a process that humans do, it saves time, labor and money, but what about the people who did that job?" he said. "We need to consider not just 'Can we build it,' but 'Should we build it?' This will not be a class about technology alone; it's a class about how technology and human society have evolved together." Kevin Hall holds the Walter E. Hicks and Blossom Russell Hicks Chair for Infrastructure Engineering in the College of Engineering's Department of Civil Engineering. He earned his B.S. and M.S. degrees in civil engineering at the University of Arkansas and received his Ph.D. in civil engineering from the University of Illinois. His research ranges from asphalt mixture design and construction optimization techniques to pavement evaluation and rehabilitation. He also has explored use of machine vision for automated condition assessment and the application of intelligent computing, GIS and GPS to manage transportation. Hall currently serves as the honors academic advisor in civil engineering and thesis mentor to four honors students. He has led three study abroad programs to Italy, which afforded him the opportunity to study Roman engineering up close. Hall has been awarded the Honors College Distinguished Faculty Award, the Arkansas Alumni Association Distinguished Faculty Achievement Award in Teaching and Research, the College of Engineering Outstanding Teaching Award for Civil Engineering, and was inducted into the University of Arkansas Teaching Academy in 2011.